Audiophile and electronics pioneer Joseph Tushinsky had a refurbished Vorsetzer in his home and over the years collected some 2,800 Welte piano rolls and created this radio show in his living room. 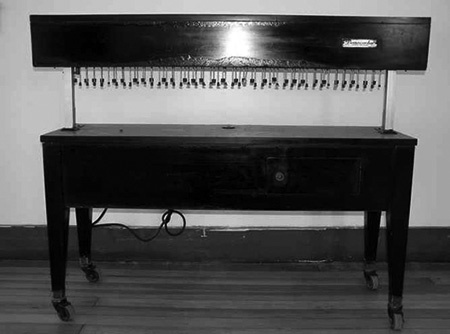 In the technology explosion which accompanied the turn of the 19th century to the 20th, a popular device began turning up in the parlors of upper and middle-class homes, the player piano. The instrument we know today as the piano developed from the hammer dulcimers of the middle ages. To play the dulcimer, the tensioned strings of the instrument were struck with a hammer to create a tone. Pipe organs were some of the first instruments to be played with a keyboard, and during the 17th century, the harpsichord and clavichord were developed as the first stringed instruments to use a keyboard. Around 1700, Bartolomeo Cristofori of Padua, Italy, invented the pianoforte for his patrons, the Medici family. While the earlier clavichord keys caused a hammer to strike the strings, the sound was dampened because the hammer would then rest on the strings. Cristofori's instrument note only provided more volume of sound, the player could vary the volume, or dynamic, of each note since the faster and harder the keys were pressed, the louder the note would be. Johann Sebastian Bach and Wolfgang Amadeus Mozart adopted the piano and used them to compose many of their most important works. The Industrial Revolution brought not only mass production of pianos and high-quality piano wire but introduced the cast iron frames which allowed for instruments with a seven-octave range (opposed to the five-octave pianos of Mozart's time). These were the pianos used by Haydn, Beethoven, Chopin, and Liszt. Although the modern piano was relatively easy to play, mastering the instrument could take a lifetime. 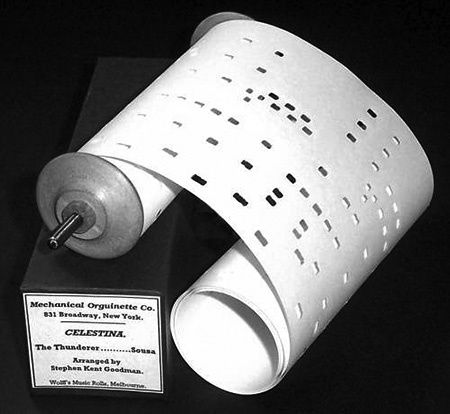 The Pianola or player piano played notes recorded by punching holes in a paper roll. The instrument was powered by pneumatic or electromechanical signals. When the holes passed a sensor, the corresponding note would play, bringing music into homes where talented musicians did not reside. The player piano did have a major limitation, however. The punched paper could play the notes accurately, but the dynamic or volume of the note could not be sensed. Thus, player pianos were mostly limited to ragtime and tin-pan alley compositions. Around 1902, German acoustician Dr. Edwin Welte developed a more accurate note recording system by making greater use of electrical sensors, carbon contacts, and mercury conductors. The Welte Vorsetzer captured everything the pianist did to the instrument during a performance, and classical musicians flocked to have their performances recorded by the device. In a traditional player piano, the paper roll mechanism is built into the piano. The Vorsetzer (literally "sitter in front") was a device which was rolled up to the keyboard of a grand piano. 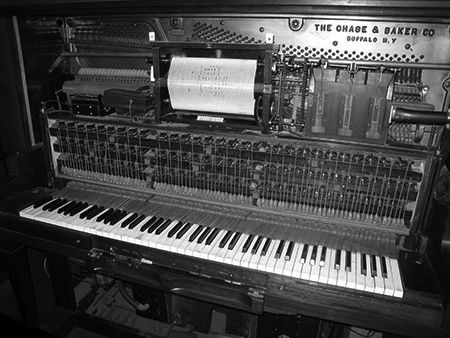 The device had a felt covered wooden arm or finger for each note on the piano, and the music played was considered a faithful reproduction of the original performance. This is the basis for the syndicated program Keyboard Immortals Play Again in Stereo. Audiophile and electronics pioneer Joseph Tushinsky had a refurbished Vorsetzer in his home and over the years collected some 2,800 Welte piano rolls. Tushinsky is considered the "father of Stereo" and his company, Sony Superscope, was one of the first to import high-quality electronic components from Japan. Hosted by South African musician and TV producer Felix de Cola, Keyboard Immortals showcased Sony Stereo technology but seems to have ben largely a labor of love for Tushinsky. The Vorsetzer played a "$12,500 concert grand piano" and the recordings were made in Tushinsky's living room, usually late at night. Although he used professional grade Sony recording equipment and had a fully equipped editing room, one problem he encountered was when the telephone rang during a recording session. He explained to Billboard magazine that it was simpler to restart the Vorsetzer from the beginning of the piece than to stop it and edit out the phone ringing. The hour-long Keyboard Immortals Play Again in Stereo began broadcasting on KFAC Los Angeles and expanded to stations in 50 cities in 1968. Be the first to comment on "Keyboard Immortals"